It’s Saturday, I’m sort of working, but decided to go out for a long lunch as a change from a week eating sandwiches at the desk. So went to a great place in Chiswick called Fishworks. I had a great people watching seat, on a balcony which allowed me to watch the fishmongers at the front of the restaurant. Although watching them gut and fillet a fish whilst eating may not be suitable for all. 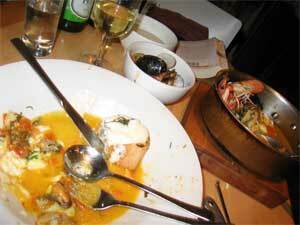 A half bottle of Pinot Blanc, aportion of smoked salmon and then the main course – Suppe del Pescatore. Basically, what I would call an interactive dish; I got a warning when 6 utensils were bought to the table to allow me to eat the dish. A serving spoon, knife, fork, normal spoon, shell crackers and one of those peculiar thin little diggers for getting the meat out of shell fish. The soup was wonderful, very messy, with a tomato and garlic base. One pile of shells later, I was ready to go. So back home I came to continue with site testing. But I did take this picture.